Good news for Ohio State, Justin Fields will be hitting the field for the Buckeyes in 2019. That decision was made official by the NCAA on Friday. Fields left Georgia after signing with the Bulldogs as a five-star member of the program’s 2018 recruiting class. 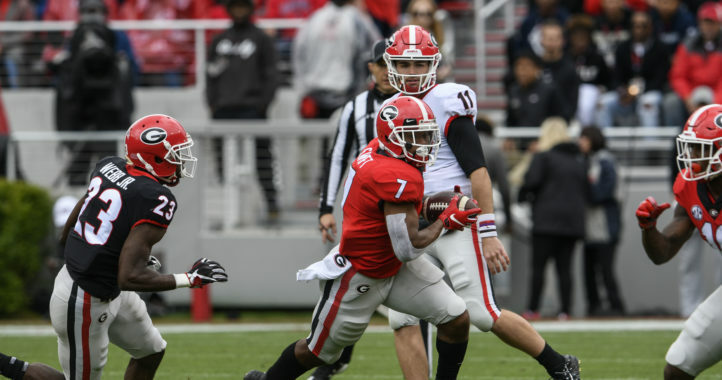 As a true freshman, Fields was never able to crack the starting lineup in Athens thanks to the play of sophomore quarterback Jake Fromm. 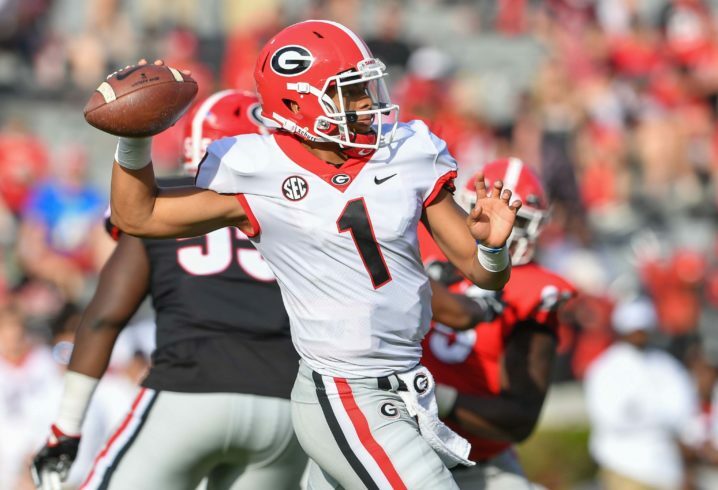 Immediately following the conclusion of the season, Fields announced he was leaving Georgia. Ohio State was quickly announced as the destination for Fields, following Dwayne Haskins’ decision to leave school early for the 2019 NFL Draft. Following his decision to transfer to Ohio State, Fields hired an attorney and planned to fight for his immediate eligibility. It has been reported that Fields waiver had to do with the culture in Athens, which his attorney was planning to argue was in question following an incident where a member of the Georgia student body yelled a racial slur during a home football game last fall. That student was a member of the baseball team at Georgia and was booted from the baseball team following the ugly incident. While Ohio State has not named Fields as its starting quarterback, the former five-star recruit and top dual-threat QB in the nation is likely to earn that nod this offseason in Columbus. Though what the student-athlete yelled was completely deplorable, painting the “culture in Athens” as hostile based on what one fan among many tens of thousands yelled while in the stands, is patently ridiculous. If it came from teammates, coaches, staff, etc. then it would be entirely different. Just grant him the waiver without requiring his attorney to create a false narrative. This was BS driven purely by the quest to start. We all know it, but the NCAA is gutless (except when it comes to imposing penalties unfairly against schools who didn’t deserve it) and Field’s attorney would have thrown more dirt at UGA if he had to continue fighting this. I’m not liking the “free agency” in college football. This is going to get much worse. BS decision, but c’est la vie. The NCAA is a fat hot mess. Not good for long term of college football. I really wish we would just get rid of the old transfer rules already. You probably want a trade deadline too, right?? There needs to be something in place to control transfers. Otherwise, it’s basically everyone signing a one year deal with no restrictions..
PC period. would he have transferred out if he was the starter…. no. Ridiculous. What a coward move by the NCAA and completely expected. Any player can pretty much transfer with no restrictions now. Just say your feelings were hurt and the NCAA waives the white flag. Free agency is upon college football now. Does anyone know what was in the waiver requests and why supporting information was used? Or is the BB player what we all assume it was all about? He pulled the race card. You really think the NCAA wouldn’t give in? They aren’t going to disclose it. They will deny it was race but the info is sealed. I’m really confused by all this. His waiver request stated that the culture and living with said culture at UGA was the cause of this transfer, allegedly predominantly racial in nature. 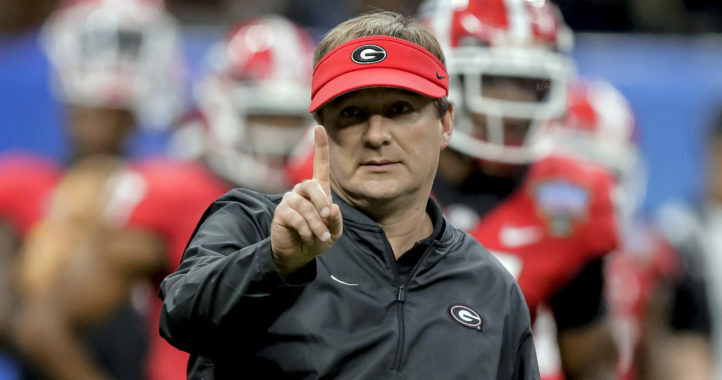 Then, after his waiver is approved, he releases a statement that his transfer had nothing to do with UGA or the football program…so which was it? Was it so terrible there that he needed to get out, or everything was ok? He likely would not have transferred if this drunk baseball player situation hadn’t landed in his lap like a gift from above. He would have had to sit a year anywhere, which would be dumb given that he would likely be handed the reins at UGA if Fromm goes NFL after this year. This was all very carefully constructed once the BB player’s comments – which Justin didn’t even hear – came to public attention. The transfer rule is inherently unfair to the student athlete anyway. I believe this will set a precedent where this ridiculous rule will go by the wayside. These players operate on a year by year scholarship, nothing is guaranteed. It is patently ridiculous to punish a player who sees an opportunity elsewhere to have to sit out. Coaches change jobs all the time, I see no reason why any student athlete should be treated any differently. Athletes are “committing” to play next four years at school. Pretty sure this rule is in place just so it won’t be a free for all when it comes to committing and playing for schools. There needs to be done accountability when it comes to choices when deciding where to go to school. Otherwise, it will be a free agency-type off-season for all players after every year. Signing a letter of intent would be near meaningless with minimal consequences. It would get out of hand really fast with players coming and going anytime they please. If you’re ok with them transferring without waiting, would you be ok with a player transferring after the regular season ends and playing in a bowl game or the playoffs for another team? Sounds outlandish, but someone will try it. Vegas would have a field day. The death of college football. Now that breaking commitments has no consequences there exists free agency. Look for other schools to be recruiting the best player on your team to fill needs for next year’s roster. Schools need to write stronger contracts and make players sign non competes. Paying players is the inevitable next step and we will get nfl light with 4-5 teams dominating college football every year. We’re already into a 4-year period where only 3 schools have made it to the NCG. Agree. Not sure if they do this already, but schools need to also guarantee 4 years of education no matter what happens on the field. That should be there payment. Especially if the player gets hurt. They need to be able to keep scholarship and finish school and the school should pay for any medical expenses due to injury. With that, players should commit to playing at that school and not hitting free agency at the moment of something not going there way. If you guarantee 4 years of education, then you need to either do away with the waiver or place very stringent standards on it. People like Luke Ford should be allowed immediate eligibility, people like Tate Martell or Justin shouldn’t. Also, doesn’t an athlete with a medical disqualification still have his scholarship for the school? I believe it just doesn’t count towards the 85 limit. Besides, it’s a business. Your health is a liability that you need to take care of, and the school does their part by providing you with facilities and top-notch care. I don’t know why anyone is surprised by this. I said when they allowed the Ole Miss players to transfer that it was going to open the flood gates for more players. Ole miss got punished for cheating… Not the same situation at all. I was definitely wrong about this one. I thought the ncaa would show a bit more foresight, but obviously not. Fields own statement makes a mockery of this ruling. Commitment no longer has meaning. Thanks for proving this point, NCAA. This is not a good thing for college football – today or especially for the future. The NCAA showing foresight would be like the NFL showing backbone. Not in our lifetimes. One guy in a crowd of 92,000 yells something inappropriate and Fields gets a waiver. Of course the NCAA was going to fold for him, they would NEVER buck political correctness and say no. The race card is a magic, get out of jail free card. Works first time, every time. He just opened the flood gates if that is the case. Now everybody will be claiming racial injustice when they transfer so they don’t have to sit a year. The NCAA and UGA were backed into a corner by the race card and it was always going to end up like this. The attorney had some nice little blackmail “allegations threats” waiting if it wasn’t approved and since it was he just smiled and said “great job NCAA!”. Everyone knows what the leverage was even though they can deny it. They will never disclose what was said. I has nothing to do with Georgia fans and everything to do with a slimy lawyer who would pull any trick to get his client approved. And how is the lawyer getting paid? Yeah, UGA fans are soooo terrible. I guess that’s why Fields’ sister still wants to play softball for the Bulldogs for the rest of her college career. Losing a second string qb is not the issue. The issue is allowing players to break commitments with no consequences. If Kentucky had anyone worth recruiting you should understand they are now being recruited by other teams. Welcome to the new college football. Kentucky fan calling someone else a toothless hillbilly is rich. I get that it must get tiring to be beat down by Georgia every year. Georgia was in a rebuilding year this year and we still beat the crap out of you. Talking smack to fans of a superior team is not a good look for you! Are you upset that You lost a player to a superior Ohio State program? Not at all, I could care less about an overrated Big 10 school. I understand that Kentucky has no depth so you are obviously confused. Losing a second string qb is no big deal. He has already been replaced. You still can’t understand my original comment. Maybe you can go to Louisville and ask someone to read it to you. You are a blind loyalist. This is not a good look for Georgia because the racist got a pass, he wasn’t even kicked out of the stadium. Someone posted what happened the next day in Facebook and it blew up. The University failed. He was a student-athlete on a full scholarship and was summarily kicked off the team within days of the game in question. You cannot pass judgment on UGA solely based on whether he was kicked out of the stadium. Ellis, Seven is trying to be a pain in the a-s to everyone one on here. If you can’t make a decent point, his favorite is to call some one a fan of there team’s major rival. Ask him about this year’s Tennessee the game against the Cats. I doubt any team in college football would want him as a fan. Through how many prisms of bias are you taking this “look”? Pretty sure if this was an average Joe player going to an average team, he would be sitting out a year. Life isn’t fair of well……..
Look, I’m black. I think the whole racial slur thing is overblown. If you allow words to upset you, you allow them to control you. HOWEVER, I can see some reasoning that people would object. To that I say, to each his own. But I’m missing how it is such a toxic environment for minorities, yet the Fields will allow their daughter to attend the university that their son just left due to racism. Maybe logic is misplaced when speaking of the NCAA, but if I were in that office, that would be my opinion. If the culture is so bad that the son needs to leave, the daughter need not attend, waiver granted.If it is a safe enough environment for the daughter to attend, it is not severe enough to warrant a waiver. It seems that the parents should know their children better than, and should have more concern for their children than the strangers at the NCAA. That would seem like a pretty reasonable guidepost on which to base such a decision.